Yes my post is days late after Mothers Day weekend, but I really needed a few extra days to reflect. I actually had a lot of fun this Mothers Day weekend, and I did not find Mothers Day fun at all before becoming a mother. I did not have a good mother growing up so while everyone else is sentimental about their mothers it just reminded me of what I didn’t have, and my liabilities. Now that I am a mother, Mothers Day has become a day of reflection on the kind of mother I want to be. 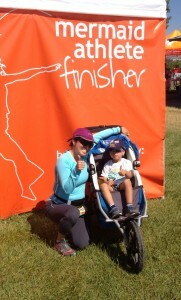 I kicked off this Mothers Day weekend with a 10K run at t he Mermaid East Bay. I was not in the best shape for running considering I hadn’t actually ran in a while, even on a treadmill. I had been focusing on doing strength training when I am not worried about all that chores that I have to do and the major changes ahead for the family that I must prepare for. This was my first race in 2 months, and I was excited because my son would be joining me on what has become “our thing” — running a race together. Interestingly enough, this race was at the Quarry Lakes, which was the place where I first took Roger on a run with me, at the Title 9K run in September last year. On that first race, he was like any other kid in a stroller — he stayed in the stroller pretty much the whole time. Now he is at the point where he would run or walk half of the 10K outside of the stroller. Since being a mother my life has changed quite a lot, and since starting my fitness journey I have really had to change and adapt my routines over and over again. Knowing when to be flexible and when to dig deep and push hard has been a tough lesson to learn and constantly work on. Yet I still have so many goals yet to reach for ahead.